Lineup: Alister Turrill Music and Sherri Parry will be joining to be bring you an epic 3 act lineup. Situated in Wexford Ireland, 20 year old twins Brandon and Ashley combine to create The Ocelots. This debut tour of Australia will include their new material as well as showcasing the first single of the forthcoming EP. They have crafted their songwriting and musical experience together to produce a forceful blend of rich harmonies and bare, raw acoustic folk. Their music perfectly embodies the breezy effortlessness of early Bob Dylan, and Simon & Garfunkel. 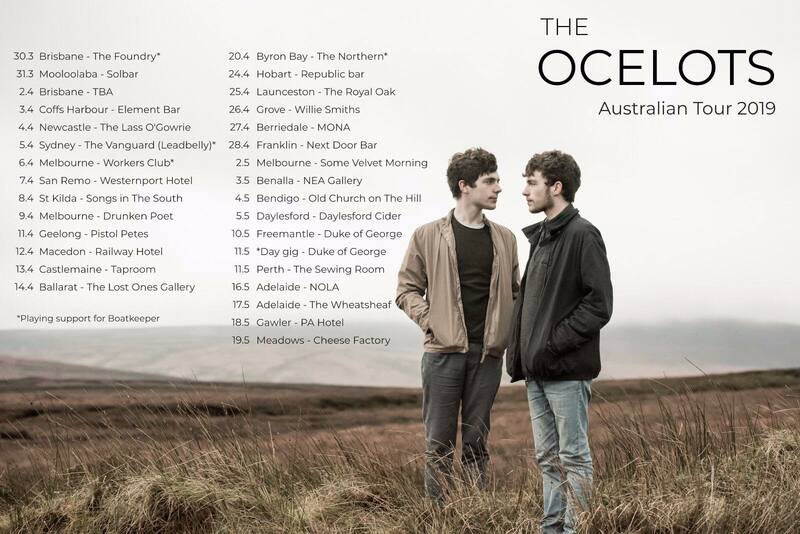 During the 2018 summer festival season The Ocelots performed all across Ireland, UK and mainland Europe and also toured with acts such as Jack Johnson, Glen Hansard, Hudson Taylor and Isaac Gracie. Since then they have been back in the studio working on their next EP which will be released in 2019.